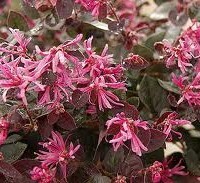 The unique burgundy leaves and the bright pink flowers on this plant is what makes it stand out among the others. You have probably seen this plant blooming around town on commercial as well as residential properties. This plant is fairly easy to grow and maintain, pruning is only necessary when trying to maintain the size of the plant. It grows best in direct or partial sun light. Loropetalums can grow to be pretty large, up to 20 feet tall. But, the plant can be maintained to smaller sizes. 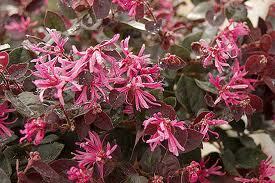 This plant is relatively new to the landscaping industry and is becoming quite popular.